E-learning theories are not new theories, but rather e-enhancements of existing learning theories (Mayes and de Freitas, 2004). Consecutive learning theories don’t replace each other, but complement each other, each contributing its legacy to learning. Theories can be considered as various levels of aggregation, with associative/behaviourist approaches addressing observable factors, cognitive approaches focusing on the ‘detailed structures and processes that underlie individual performance’ and situative approaches taking into account the social and cultural aspects of learning (Mayes and de Freitas, 2004). Activity designs are usually a blend of different learning theories. Being aware of the main learning theories helps building a consistent design and clarifying what type of learning and interaction is intended. An example provided by Goodyear (2001): It is not uncommon to find some members of a team believing that learners are poor at organizing themselves and learn best by being fed information in small amounts, while other members of the team want to promote active, student-managed learning. Research on memory, perception, reasoning, concept formation. Tertiary: dialogue and new learning. Mayes, T. and de Freitas, S. (2004) Review of e-learning theories, frameworks and models, Bristol, The Joint Information Systems Committee, [online] Available from:http://www.jisc.ac.uk/uploaded_documents/Stage%202%20Learning%20Models%20%28Version%201%29.pdf(Accessed 28 May 2012). By Jonathan Vernon in E-Learning, H809: Practice-based research in educational technology, L&D, MA in Open & Distance Education, The Open University on June 11, 2013 . Thanks for a great break down of theories, mush appreciated. One of my lecturers Beat created a similar blog post, I thought you might be interested. 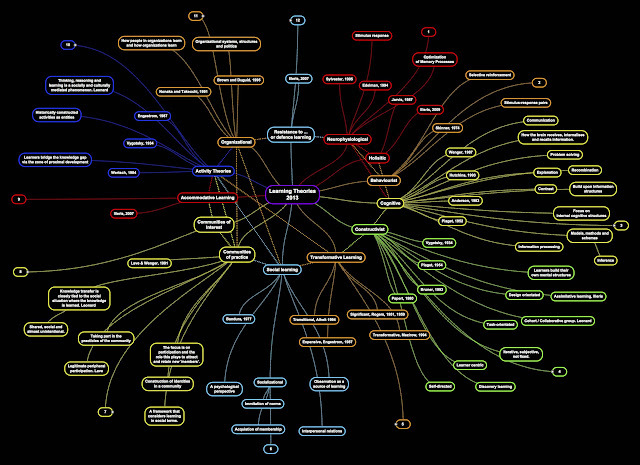 The mind map is created in SimpleMinds App. I can provide a link and if you download the image you can then ammend or add to the map, or tweek it to improve legibility.